With Solo: A Star Wars story not exactly setting the cinematic world on fire we now turn our attention to the future of the franchise and where it could go next. Disney has already been quite open with its plans for the intermediate future and where it plans on taking Star Wars. First will be Episode IX brought to us by J.J. Abrams, sometime down the road will will be Rian Johnsons/Darth Betrayus personal trilogy of films, and a separate and new Sequel trilogy which will likely continue into “Episode X”. All the while in between we have stand alone Star Wars Stories, the topic of this conversation. As we know Star Wars as franchise has a deep reservoir of lore, with thousands of stories worthy of adaption and thousands more that are not. Both within canon and out of it the Star Wars Stories can be a varied and inventive place to take the franchise. Here are some stories that would make interesting stand alone films in the wide universe of Star Wars. The Rule of Two as a story is one of the most pivotal in Star Wars influencing nearly everything that has happened in the entire franchise. However, unless you are very familiar with the backstory presented in the old Legends continuity and television series you also likely know next to nothing about it. Which is why it would make such an interesting film it would provide a new story that expands on the world we already know. It would effectively be the Sith’s Rogue One. 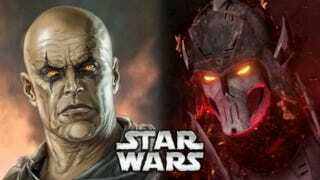 Staring Darth Bane it would differentiate itself from other Star Wars film as he would be the first villain protagonist for the franchise. As Darth Bane as presented in all his appearances was not a good guy but he was certainly compelling. Looking at the Sith during both their highest peak and greatest downfall would make for an enjoyable film. As a general rule Star Wars films trend closer to the action adventure side of things and for good reasons, it works and is a lot of fun. That being said their are other types of stories out there and a film I think would be interesting is if Star Wars stripped away all its grandeur and got down to basics. A Star Wars noir crime thriller set on the streets of Coruscant for example, a place we know but we do not really know. One of the benefits of this style film is the budget wouldn’t be cost prohibitive meaning making it as a one off would be possible. It would also allow the franchise to expand beyond what was known before, it would be radically different and that is a good thing. If we are going to get Star Wars Stories for a decade or more why not something weird one of those times. If Lucasfilm is set on making Star Wars Stories centered around past characters then there is no finer pick the former Darth Maul. Widely regarded as one of the best parts of the abysmally bad The Phantom Menace, Darth Maul through television has seen something of a renascence in the eyes of fans. Becoming a central player in the interquel events of both Star Wars: Clone Wars and Star Wars: Rebels. However as any nerd knows if its not in the movies the average fan wont care. Which makes his adventure perfect for a future adaptation. He also ties in quite nicely with other key characters like Obi Wan-Kenobi, a character that seems destined to get his own film down the line. A duology of films focusing on Obi Wan and Maul would compliment each other nicely and embrace the central idea of balance between light and dark. When Bioware was given the rights to produce a Star Wars RPG they had a choice. Either make one set between The Empire Strikes Back and Return of the Jedi or any other timeline in the Star Wars universe. They choose the Old Republic due to the freedom it presented. As there were so many interesting stories to tell. The Jedi-Sith Civil War, the Mandalorian Wars, the expansion of the Republic, tales of deep space, and more. The possibilities were endless and still are. With the Legends continuity erased there is even more room for inventive story tellers. It would be a shame if the Star Wars Stories only stayed within a seventy or eighty year time span. After all Star Wars is set a long, long, time ago. I am totally joking but I would love to see the Star Wars fans reaction if they made a mascot based kids movie or something. It would be hilarious. If you say the name Grand Admiral Thrawn to any Star Wars fan they will likely have heard of the character, even if they haven’t read his books. Widely regarded as the greatest addition to the Star Wars canon from the Legends continuity he was so good Disney imported him almost in his entirety to the new canon. With very little changes. Thawn would make a brilliant protagonist (or antagonist) for any myriad of stories. His story of overcoming xenophobia to become the only non-Human Grand Admiral I believe should be of the utmost consideration. Furthermore, through his story we could get a deeper understanding of the Empire and its functioning and hierarchy. To put it bluntly Thrawn is a piece of Star Wars that needs to be on the big screen. Donald Glover as Lando in Solo was a huge bright spot for the film. In many ways a blend of character and actor that rivals Harrison Ford and Han Solo. I think it is pretty damn clear people would be more then willing to see a Lando film, especially as the character has been criminally under utilized in the sequel trilogy. Also it would be a good was to run out Alden Ehrenreich’s two remaining films on his contract. Basically at its core Star Wars is a huge franchise full of interesting stories that would make for compelling films. With Solo’s likely financial failure in the eyes of Disney they need to learn the right lessons. Safe choices dont make for good films and box office returns, take risks, do something new. The world of Star Wars is more then Solo’s, Skywalker’s, and their broodlings. Its a galaxy of mystery and adventure that is just waiting to be explored. If they are willing to spend $400,000,000.00 on Solo making it one of the most expensive films in the franchise why not put that money to something interesting.